Therapeutic cancer vaccines represent a type of active cancer immunotherapy. Clinicians, scientists, and researchers working on cancer treatment require evidence-based and up-to-date resources relating to therapeutic cancer vaccines. Vaccines for Cancer Immunotherapy provides a reference for cancer treatment for clinicians and presents a well-organized resource for determining high-potential research areas. The book considers that this promising modality can be made more feasible as a treatment for cancer. 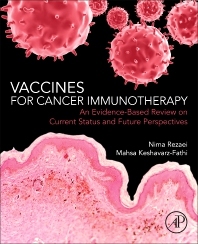 Chapters cover cancer immunology, general approaches to cancer immunotherapy, vaccines, tumor antigens, the strategy of allogeneic and autologous cancer vaccines, personalized vaccines, whole-tumor antigen vaccines, protein and peptide vaccines, dendritic cell vaccines, genetic vaccines, candidate cancers for vaccination, obstacles to developing therapeutic cancer vaccines, combination therapy, future perspectives and concluding remarks on therapeutic cancer vaccines. Nima Rezaei is professor of clinical immunology at Tehran University of Medical Sciences (TUMS), vice dean of international affairs in the School of Medicine, and deputy president of Research Center for Immunodeficiencies. He received his PhD in clinical immunology and human genetics from the University of Sheffield in the UK after graduation in medicine (MD) from TUMS. He wrote hundreds of papers and edits for leading book series, and is the founding president of Universal Scientific Education and Research Network (USERN), where directing a number of interest groups such the Network of Immunity in Infection, Malignancy and Autoimmunity (NIIMA) and the Cancer Immunology Project (CIP). Mahsa Keshavarz-Fathi is a medical researcher and MD candidate at Tehran University of Medical Sciences (TUMS). She is also the managing director of the Cancer Immunology Project (CIP) and Breast Cancer Association (BrCA) undertaking and managing different research projects in the field of cancer treatment, cancer immunology and immunotherapy.